The Nutcracker and the Four Realms is a wondrous, visual experience that is somewhat light on substance. Apt acting and sensational ballet dancing excel and make this something more memorable than the premise might suggest. Any Disney fans will want to check this out. The story follows young Clara (Mackenzie Foy) as she recovers from her mother's death. However, a spark of hope lightens Clara after seeing her late mother's parting gift of a box with a hidden key. This key belongs to a parallel world, unlike anything, to which Clara must travel to obtain the key. With the help of budding soldier Phillip (Jayden Fowora-Knight), Clara learns of all obstacles that await, especially in the form of the menacing Mother Ginger (Helen Mirren), leader of the Fourth Realm. Most importantly is a looming war that could preside over the three Realms that are at peace - Land of Snowflakes, Land of Flowers and Land of Sweets and are threatened by the Fourth Realm. In the three Realms resides Sugar Plum (Kiera Knightley) who is on same page as Clara and braves her up for the Fourth Realm as the fate of the Realms and her mother's dying wish relies on it. Mackenzie Foy, as Clara, well presents her character's central struggle to find her inner place amidst all the tragedy, while also being hopeful and cheerful. The end result of this character development is a joy to watch and most definitely the movie's best subplot, amongst all the other slumberous ones. Kiera Knightley, as Sugar Plum Fairy, regales with well-written comedic relief, but the timing of her intervention seems quite random and very over-the-top at times. Regardless, children, most of all, will find enjoyment with all the youthful energy. Jayden Fowora-Knight, as Philip, is my favorite character, despite this being only the second film he has appeared in. His charm and braveness add a relentless vigor to the character that never gets old. Helen Mirren, as Mother Ginger, likewise shines, despite her character suffering from a lack of screen time and character development. With what she is given, she shines with the menacing undertones that could mean good under the entire demeanor. Also, Misty Copeland's cameo is full of entertainment with her ballet proficiency bringing a certain something to the stage without feeling like a forced addition. Instead, it feels more like a celebration of the Nutcracker's roots and remains my favorite scene. Lasse Hallstrom and Joe Johnston expertly direct the visual flair with clear attention to every nook and cranny of the special effects and sound design. Despite this, the movie has flaws coming from the lack of a compelling story line, aside from Clara's inner struggles. Everything feels introduced way too quickly and without clear meaning. This leaves the movie feeling rather inconsequential and just an excuse to put the Nutcracker on the live screen. Still, the movie delivers an amazing awe to each scene's production. The story is simple, but powerful in concept. This is the journey of Clara (Mackenzie Foy) who is dealing with the loss of her mother, trying to reconnect with the world and with her family, especially her father. On Christmas Eve, she receives a special gilt from her mother - a mysterious box. But, she is missing the key. With the help of Drosselmeyer (Morgan Freeman), her godfather, she enters a world of mysteries with characters that will help her find the key. When she first enters, a cute mouse has the key, but is impossible to catch. She meets a Nutcracker soldier, Phillip (Jayden Fowora-Knight) who tells her about the realm of Flowers, the realm of Sweets and the realm of Snowflakes, but warns her about the dangerous fourth realm and Mother Ginger. But, Clara is determined to find the key and will do what it takes to find it. This film has the power of captivating you. There are moments I was really afraid and others I was delighted and amused, depending on the characters in the scene. It has the power to be frightening, like in the fourth realm, with all kinds of circus characters. All the performances are amazing. Mackenzie Foy conveys innocence and courage at the same time and is just perfect for this role. She has an ethereal look and is a brave actress who did as many of her own stunts as can could. I love that she is a princess and a hero at the same time. Morgan Freeman adds gravitas to his role and a sense of wisdom. Mexican actor Eugenio Derbez is so flamboyant and adds a nice touch to the cast. Keira Knightly is the perfect fairy. She has a special tone in her voice. Helen Mirren is also absolutely believable as Mother Ginger. There's a mystery about her character and, despite her bad reputation, you want to know more about her. Actually, the only thing that bothered me in this film is that we don't know her back story and why she is a villain when we first meet her. I love the ballet and the fact that the filmmakers decided to incorporate dance into the story. Misty Copeland's dancing is flawless. She is the first African American woman promoted to principal dancer in American Ballet Theater. Although the story is simple, all the visual and camera work put you in a fascinating world you are exited to be part of. The costumes are beautiful and the art direction and production design deserve an Oscar nomination. Do you remember The Nutcracker ballet? What about Cinderella? As I screened this film, both childhood memories came to mind. 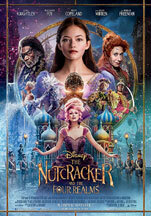 Disney's The Nutcracker and the Four Realms has brought the magic of Disney back to the big screen. From the beginning of the film, your senses will be ALIVE! Every set looks edible with color and life. Truly, this live-action Disney film is a breath of fresh air. Clara (Mackenzie Foy) is an amazing young protagonist. I found myself drawn to her curious nature and determination to live up to her mother's curious nature. As a young girl, she plays a curious and adventurous spirit, who is also very mechanically inclined. She amazed me by her desire to succeed, and her courage. She walks into dark spaces knowing she is enough, and encounters creatures who challenge her along a path of discovery. She encounters toy soldiers and magical mice - some of whom are not kind! Clara's quick mind and wonderful, kind skills help her get through a lot of sticky situations! Without giving too much away, the gist of the story is about a gift, presented by her Father, but left to her by her mother at Christmas. Her second gift is from her godfather Drosselmeyer (Morgan Freeman) at his annual holiday party, which leads her to a coveted key - which promptly disappears into a strange and mysterious parallel world. From one world to the next, Land of Snowflakes, Land of Flowers and Land of Sweets, Clara and a soldier she meets named Phillip (Jayden Fowora-Knight) must brave the ominous Fourth Realm, home to the tyrant Mother Ginger (Helen Mirren), to retrieve Clara's key. Hats off to the costumers and make-up artists! I give this film 4 out of 5 stars and recommend it for ages 4 to 18, as well as adults. You should know this film deals with the death of a parent. It opens in theaters nationwide November 2, 2018. Look for it! You'll be glad you did.